Despite weak freight rates so far this year, Dry Bulk shipping earnings are forecast to recover as demand for both major and minor bulk commodities rises, according to the Dry Bulk Forecaster report published by shipping consultancy Drewry. Freight rates have been depressed due to a continuing oversupply of vessel capacity, despite recent moderation in the growth of the fleet. 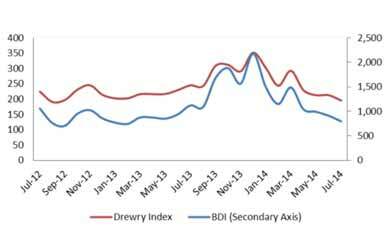 Drewry’s Dry Bulk Freight Rate Index, a weighted average of earnings across multiple trades, declined 39% in the six months to June. Drewry estimates that the dry bulk global fleet grew at an annual rate of 1.3% in the second quarter of 2014, down 0.4% on the first quarter. Some of this growth was the result of declining inactivity as vessels previously laid up due to bankruptcy proceedings came back onto the market. But much of the damage relates to over ordering of previous years, which has left the industry with an operating surplus of over 240 million dwt. global fleet. On the demand side, strong growth in Chinese iron ore imports were partly offset by a contraction in coal and grain shipments. Chinese imports of iron ore grew 12% quarter- on-quarter, driven by domestic smelters’ preference for high quality and low cost imports. Grain shipments were impacted by adverse weather conditions and geopolitical issues in Eastern Europe. Chinese steam coal imports declined around 4% in the year to June, reducing earnings of Capesize and Panamax vessels. Chinese imports of iron ore are expected to slacken off through the remainder of the year due to large stockpiles, but demand is forecast to grow at an annual rate of 6% in the period to 2019. Driving much of this recovery will be increased demand for both major and minor bulk commodities. “Looking further ahead, we expect earnings to recover gradually across all vessel segments over the next few years,” added Sharan. Dry Bulk Forecaster is published quarterly by Drewry Maritime Research.